We’re back from a very happy honeymoon in Barcelona. We took the overnight train between Paris and Barcelona because we thought it would be romantic and also because we’ve sort of made a no-fly pact due to all the atmospheric carbon produced by the aviation industry. I recently read a news article on the Web, which asked if flying had been unfairly demonised. Would you believe it, flying could actually be more efficient than using my diesel van. The point is the distances travelled: i.e., one wouldn’t drive the distances that one might consider flying for a summer holiday. It did make me smile though, at the thought of parking my private jet outside the village boulangerie and walk in, past startled locals to buy my baguette, all in the name of being super-eco-friendly (I’m not sure that there’d be enough distance to take off and land again though!) As English friends both drove and flew to come to our wedding, I do wonder who was most carbon-friendly over the same distance? Anyone who’s really up on carbon footprints and suchlike, please post a comment. Anyway, back to the romance of Barcelona. The train was indeed romantic. 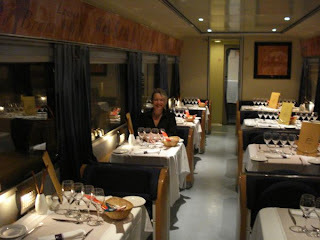 It was no Orient Express: the cabin-ette allowed sleeping or standing but not both opportunities simultaneously and sitting on the toilet left an impression of the showerhead on one’s forehead but the restaurant car was fun and felt like real luxury. We realised the benefit of getting an early seat (photo shows the return journey, when the train hadn’t even left the station). 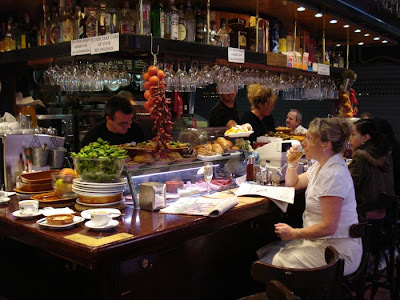 And so to Barcelona and breakfast in the famous market off Las Ramblas: the French call breakfast le petit dejeuner but there was nothing small (petit) about ours. We picked up a (same day) English newspaper as a rare treat and then sat down in a colourful and delicious setting—a bar right in the middle of the most picturesque food market you could imagine—to a plate of Spanish fried tapas, looking greasily appetising and unhealthy in equal measures, and it would’ve been rude, as seemingly everyone else had an alcoholic drink, not to order two tall glasses of cold sparkling cava to wash it all down (see pic at top). On the first morning, while still laughing at what a treat all this was, a slim young Catalan businesswoman sat down next to us and ordered up a fish the size of a plate, without accompaniment, and a glass of rosé wine—for breakfast! I’ll never look at a bowl of muesli in quite the same way again. 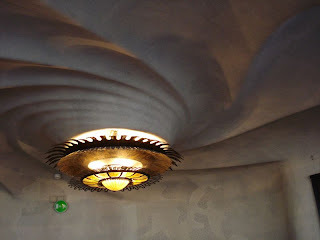 And so to a gentle walking tour of the curvaceous architecture of Antonio Gaudi. 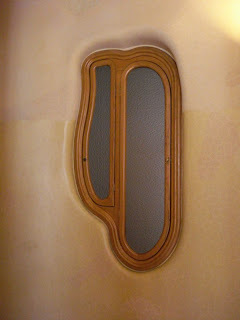 We found Casa Batlló particularly inspirational: it’s pulled our thoughts round firmly towards getting on with the design of our proposed straw-bale house. The photos show a ceiling and internal window in that building. Park Guëll is also impressive, with palm trees and Gaudi’s mosaics looking down over a more prosaic modern city skyline. He claims to have been inspired by Nature’s forms but I couldn’t help wondering, when looking at the over-exaggerated fairytale rooftops at the entrance, whether consumption of LSD might not also have been involved (remember, just say “no” kids). I am *SOOOO* jealous. 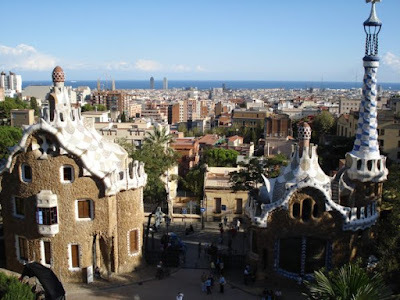 I love Gaudi and I'd love to visit Barcelona. As for a Gaudi-esque straw-bale house - what a brilliant idea! You have to do it. Can I help? I have experience at mosaic making. Glad you had such a good time! Again--Congrats!